Who said that you had to wait until Black Friday to pick up some great deals. Take a look at what Best Buy is doing right now with the Google Pixel 3, Pixel 3 XL and Pixel 2 XL. The Pixel line has become the one that Android fanatics have been buying because it gives them first crack at the latest Android builds and Google enhancements like "Night Sight," and "Call Screen." The former allows users to shoot visible photos under low light conditions, and the latter uses Google Assistant to screen potential spam calls. Pixel 3 64GB-24 monthly payments of $24.99 ($200 off). Pixel 3 128GB-24 monthly payments of $29.16 ($200 off). Pixel 3 XL 64GB-24 monthly payments of $29.16 ($200 off). 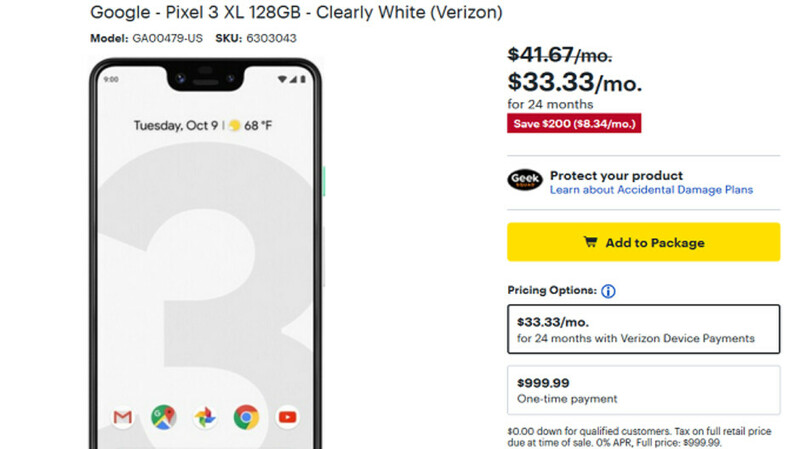 Pixel 3 XL 128GB-24 monthly payment of $33.33 ($200 off). Pixel 2 XL 64GB-24 monthly payment of $18.74 ($400 off). Pixel 2 XL 128GB-24 monthly payments of $22.91 ($400 off). Color options for the Pixel 3 and Pixel 3 XL include Clearly White, Just Black and Not Pink. Color options for the Pixel 2 XL include Just Black and Black and White (Panda model). You can save even more by not buying one.